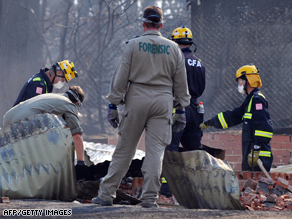 The death toll from bushfires in southeastern Australia has risen to 208, the Australian Red Cross said Thursday. Five fires are still burning across the state of Victoria, a spokeswoman with the Country Fire Authority said. All are contained, but one of the fires spawned a smaller blaze that is actively burning, said the spokeswoman, who asked not to be named, in line with policy. That fire is burning in the area of Narbethong, about an hour north of Melbourne. “Two communities are in that area, we suspect they may be directly impacted by that particular fire,” the spokeswoman said. “Residents in that area are being asked to action their fire plans.” The Red Cross said it has teams in 13 locations across Victoria to help with first aid, food, and personal support. Australian Prime Minister Kevin Rudd announced a national day of mourning Sunday to honor the victims of the bushfires and recognize the efforts of emergency workers. “This day will give all Australians the chance to reflect and remember this terrible tragedy as an important step in rebuilding these communities,” he said in a statement. The fires have destroyed more than 1,800 homes and displaced about 7,000 people. At the height of the fires, about three dozen separate blazes were burning. A suspect, 39-year-old Brendan Sokaluk, has been arrested on suspicion of setting one of the fatal fires.